That’s right, AEPi now has a chapter in the land down under. 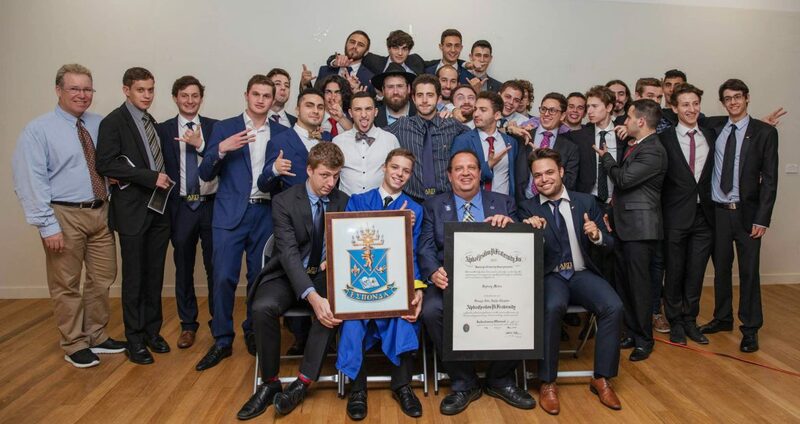 With 75 in attendance, the Omega Zeta Alpha chapter of AEPi received an official charter on Saturday, May 5 from AEPi’s executive director Andy Borans. AEPi colonies strive toward the goal of receiving an official charter. Organized in 2016, this 42 man group is no exception. “They really surprised us. It can be a little daunting opening up on the other side of the world but their founding leadership was exceptional. It’s hard to imagine that a group which has never seen what fraternity life is like in the US can so well encapsulate what it means to be part of AEPi. They’re fun to be around, intelligent and always welcoming,” said Kyle Whitlock (TCNJ, 2014) the chapter’s educational leadership consultant (ELC). Praised by those who spoke for promoting Jewish life and working well with Jewish partner organizations on campus, the chapter is excited to keep the ball rolling. “We’ll just continuously grow. The whole process will keep the Jewish community aware. When something happens, it spreads easily. Word of mouth is going to benefit AEPi so much in Sydney,” said Brother Katz. Mazel tov to AEPi’s newest chapter across the globe! See more of AEPi Sydney by following them on Facebook and Instagram.